There are a couple of fairly good reasons for 'tuna pasta' being a perennial favourite in student kitchens around the country. An important factor is that it's cheap to make and money is always an issue for students. It's also quite a nutritious meal, it's very quick to prepare and you don't need any real culinary skills in order to create this simple dish. However, probably the most important factor is that it can be prepared from ingredients that don't need to be bought fresh. With just a couple of items from the cupboard and a few minutes in the kitchen, you can enjoy a hot, filling and delicious meal. Buying food that will last is an important consideration when you're a student. If you live in a shared house food will inevitably disappear and things won't be re-stocked quite as often or efficiently as they were back at home. With this in mind, it's important to have a few long-lasting, staple ingredients that you can always fall back on to make a meal. If you're dashing in from lectures and then out to the pub, you want a quick bite to eat that will fill you up. You don't want to be shoving a lump of cheese between two crusts of bread that have seen fresher days. It doesn't take too much forward planning to buy certain provisions that will last for months and can be stacked up in the cupboard. Of course, if you then have some other fresh ingredients, by all means use these to liven up plain dishes, but the idea is that you don't need to rely on them all the time. Pasta, rice and couscous are all great for quick, easy meals. If you're really in a hurry, choose from the range of quick-cook pastas. Couscous works well with any combination of tomatoes, olives, lemon juice, pulses and peas. Obviously, if you have meat and other vegetables do use them but we're just talking about making meals from long-lasting foods for the time being. A few curry sauces and pasta sauces should help you out of tricky situations. Passata (sieved tomatoes) is great if you want to make your own sauce, while jars of olives, sun-dried tomatoes, capers and pickles will provide a bit of extra zing for sauces or pizza toppings. Tuna and salmon are obvious essentials for combining with rice or pasta for quick, filling meals. Chopped tomatoes are great for whipping up a quick pasta sauce. Look out for varieties with added herbs or garlic. 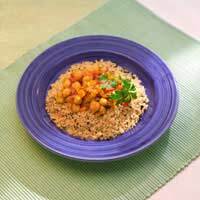 Chickpeas and other pulses are ideal for veggie curries, whilst baked beans are the ultimate snack food and can be eaten for any meal. Whether you're going into college for the day, coming home for an evening in, or are about to head out for a night on the tiles it's important to eat a decent meal. There's no need to make do with a piece of toast if you have a cupboard full of cans - it's amazing what you can rustle up with just a little imagination.